I have recently joined the open section of #MSLOC 430 - a graduate course in the Master's Program in Learning and Organizational Change at Northwestern University. This is the first week and I am absolutely looking forward to exploring the topics, learning from the other participants and participating in exciting conversations. The four topics we are planning to deep dive into in the first two weeks are: a) Networked learning, b) Personal Learning Networks, c) MOOCs, and d) Communities of Inquiry. These are all areas of interest for me, and my hope and plan is to find (make) sufficient time to explore each of these in depth. Given that I have been writing about PLNs and MOOCs for some time now, I thought I would delve a bit deeper into the importance of building PLNs in this post. I have written about the impact of various shifts and trends like globalization, work fragmentation, ubiquitous network and access to the mobile web, social media, and the economy of individuals on the way we work and learn in the following posts: Re-imagining Work and Learning in a Networked World, Working out Loud and Serendipity and The Changing Face of Work and Workplace Learning. Here's a list of related posts on learning in a networked world. The world of work, and life in general, is transforming due to profound shifts in various areas. These shifts have far-reaching implications on all aspects of our life. The focus of this post is to highlight how they impact work and careers, and why is it more important than ever before to intentionally build a PLN. One of the outcomes of this impact is a need for employees to take charge of their own professional development. Those with cutting edge skills in their core areas of expertise will continue to see demand for their work while others waiting for orgs to re-skill them might just run the risk of becoming irrelevant. One of the ways to keep on top of our game, and remain on the cutting edge of relevant skills and knowledge is to be a part of communities of practices and to focus on building and maintaining our PLNs with a deliberate intention to learn, share and collaborate. The ubiquitously connected world and the phenomenal rise of mobile devices are going to impact and disrupt how we drive our professional development. The diagram illustrates some of the possible approaches to creating our PLN within an organization. 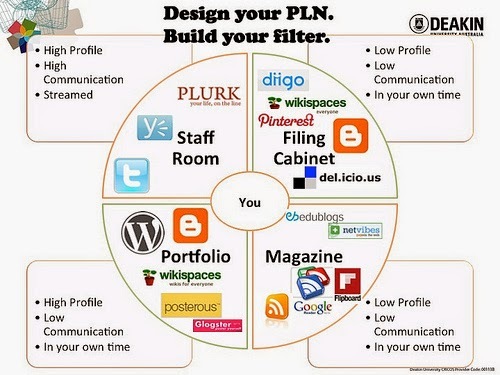 Why is building a PLN so critical, especially today? Learning networks are based on the theory of Connectivism, or learning from diverse social webs. Connectivism, the theory underpinning how we learn and interact in the networked era, implies that learning relies on communicating ideas and having meaningful interactions. A PLN is an enabler of such learning. A PLN can be seen as one's gateway to continuous learning, exchange of thoughts and ideas, validation of one's thoughts and insights on challenges encountered, and an involvement in the process of continuous inquiry and exploration on topics that matter. In today's context of rapid change, unexpected challenges, and complex scenarios, it is not possible for an organization to provide training for every conceivable skill that may be required in the future. Moreover, since a large part of the skills and knowledge required to handle tasks and problems today are emergent, the possibility of training gets ruled out. Training is essentially past focused preparing workers for known skills and bridging known knowledge gaps to meet known and defined goals. What happens when the knowns become unknowns? What happens when speed and innovation are the keys to success? An analysis of the diagrams above reveal that there are primarily 5 steps in the entire PLN building process - Explore, Collect, Review, Re-create, Share. 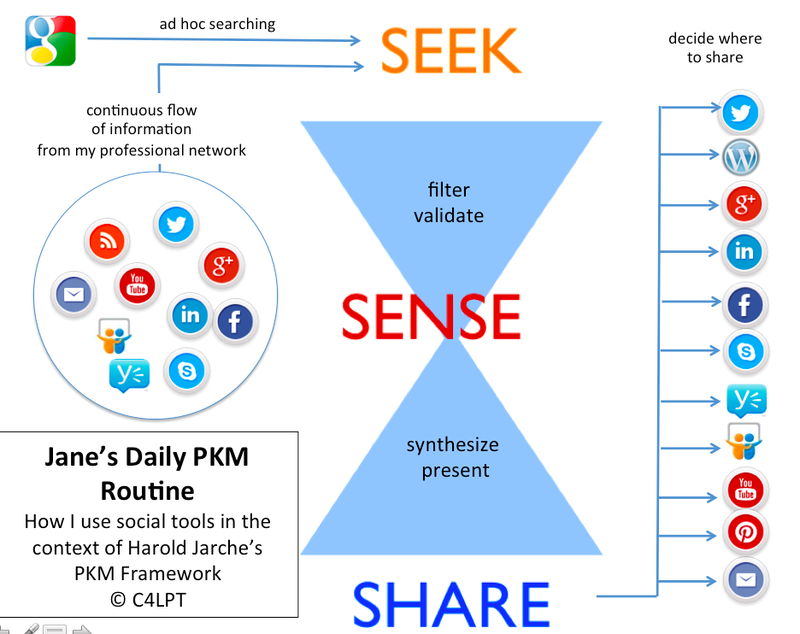 I would also like to emphasize that PLN is intricately linked to one's personal knowledge management (PKM) capabilities. The former wouldn't make sense without the latter. With complexity, chaos and flux taking over and becoming the norm, we can expect codified knowledge stocks to have very short shelf-lives. A constant state of flux is giving rise to ambiguity, uncertainties and volatility — the characteristics of a VUCA world. We have moved from an age of best practices to emerging practices and no one can be intelligent on their own any more. In this kind of a scenario, learning and sense-making happen through reflection, dialogue and direct application to test hypothesis. Trying to make sense of a complex situation alone is the equivalent of six blind men trying to comprehend the characteristics of an elephant. This is where an individual's PLN becomes important, and the more diverse it is the better. Diverse here implies cognitive diversity -- arising from different world-views, cultural perspectives, varied educational background, and possessing different problem-solving frameworks and heuristics. A PLN of diverse individuals not only helps to hold up widely different viewpoints on the same challenge but also broadens and deepens one's learning. Diversity of thoughts and ideas are the best precursors to innovative and creative solutions. PLNs typically consist of strong and weak ties. Exchanging of deep and tacit knowledge, i.e., knowledge which is not codified and where learning happens through the process of dialogue and reciprocity typically work with strong ties. Weak ties bring in the much needed variety of thoughts and opinions. One's PLN should ideally consist of a mix of strong and weak ties to maintain a balance. Creating and maintaining a learning network has huge possibilities with mobile and social becoming a way of life in a highly networked and ubiquitously connected world. We no longer need to wait for that conference or that special workshop to meet like-minded folks. We can find them and connect with them on Twitter, LinkedIn, Quora, Pinterest... Each platform has its unique strengths and can be used accordingly. It requires some hands-on exploration to understand the platforms. We need a new set of skills. 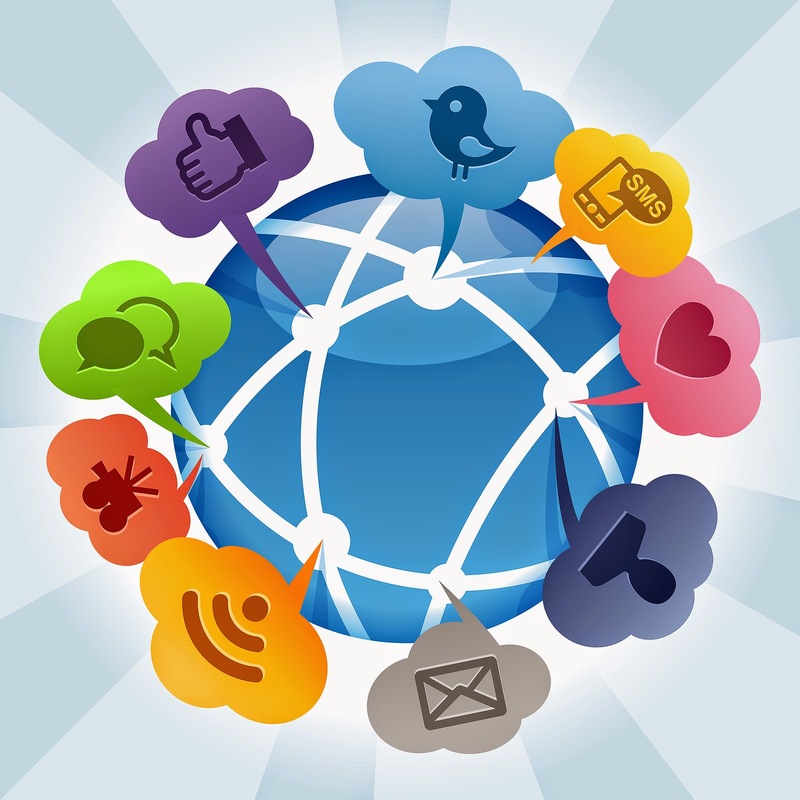 Building one's PLN in the online world requires skills like networking, participating in communities of practices, collaborating online, and curation and aggregation to process the information. While developing the skills do take some effort and persistence, the benefits are tremendous and provide the necessary motivation. The diagram below illustrates how one can go about building one's PLN on Twitter. However, the most important point to remember is that social learning and collaboration is a mindset, an attitude and not just a set of tools. The tools and platforms are facilitators and knowing how to use them is important. But it is out attitude that makes interacting with our PLNs fruitful and satisfying. 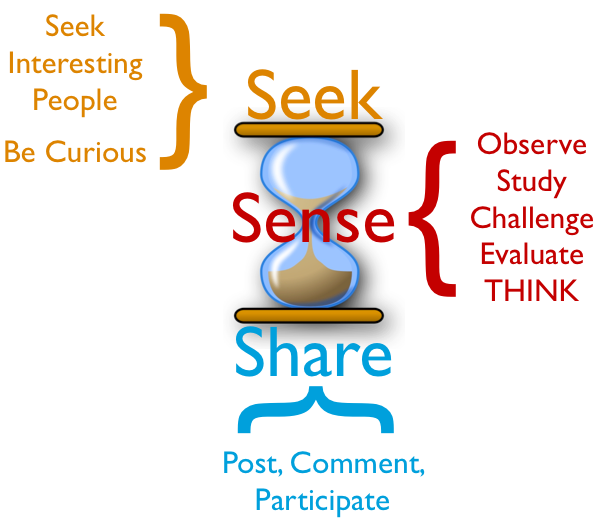 While it seems to be a series of steps, it does require engagement, reflection and effort. It is also a state of mind. IMHO, people with a growth mindset are likely to invest time and effort in building and maintaining a PLN because they believe that there is always an opportunity to learn more, to improve and explore. Thus, they will very likely reach out to their network with queries, go to reference links and read what people are sharing, and then apply the learning back to their work.